What is known as Drexciyan Connection first surfaced as a live package of Dopplereffekt and Sheram Ingram (either as DJ Stingray 313 or live as Urban Tribe) which Dopplereffekt bookers Kontra-Musik began to offer sometime last year. I think there has already been one Dopplereffekt show with Ingram in Stingray mode somewhere in Europe but now the Bang-Face Weekender is listing Drexciyan Connection (Dopplereffekt and Urban Tribe playing separate live shows) for this years festival in April 2009. This will make up for Dopplereffekt having to cancel due to equipment problems last year. Incidentally Kontra-Musik is now also handling bookings for Annie Hall aka Moreno Paradox of Daughter Produkt. They already look after Penelope Martin of Zwischenwelt. WeMe Records are also now advertising the release of a 12” under the name Drexciyan Connection said to feature Dopplerefekt and DJ Stingray 313. I emailed them and they replied that it will be a 3 track 12" which will be out soon. They are a label based in Belgium and have previously released Stingray’s ‘Aqua Team’ 12”. It will be interesting to see if this loose collaboration between Mueller and Ingram develops, but so far it is just a marketing exercise. There are currently four great tracks for you to discover on her player, most of which you'll probably dig if your already into Zwischenwelt, 'White Witch' is my pick. One of them is 'Shadow Being' which has been on the Zwischenwelt player for sometime and it has been confirmed that all the others are Zwischenwelt tracks as well. 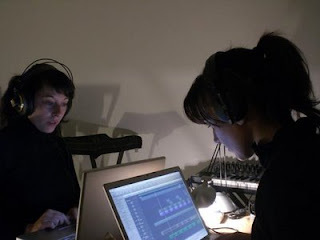 There is even a picture of Susana making music with Penelope Martin in November 2008, check it out above. I'm sure from that shot that someone could even tell us what programme they are using! Already someone is saying it is Logic Studio!! Click again on image for larger version. Can't wait for that album which should be appearing soon. Will 2009 be the year of the MySpace projects? Which one next? Professional looking video of the first 10 minutes from Dopplereffekt at BEMF festival, Belgium on 21/3/09. New official video up for the Zerkalo track 'I Know More' on YouTube. The audio for this track has been on their MySpace player for awhile and in fact this video was even up for a short while last year until it disappeared. Looks like this time it's there for good and it's another good one. This post is having to be rapidly updated thanks to my eagle eyed readers, first there is a new Arpanet remix on Sebastien Tellier's new 12", 'Kilometer'. According to the Victoria Lukas MySpace a Zerkalo album will be released by Clone in May 2009. Zerkalo will also be touring Europe with Weltgeist, one of her other projects, in April and May. Maybe get in touch and book them? Got a few surprises when I went trawling YouTube and elsewhere for new Drexciya related videos, here's the choice examples of what I found. Someone finally posted the Intellitronic track 'Pixel' which is a very very rare Gerald Donald solo production. There was only ever this one track under this name and it turns out to be a soulful gem which even I hadn't heard till now. Originally found on the Juan Atkins compiled 'Magic Tracks: Deep Detroit' compilation way back in 1993. Another Clarence G track appears on YouTube, this time it's 'Clarence G's Club'. Both the Scan X remixes, wow, what a treat. First time for Station Rose - 'Dave' (Heinrich Mueller: Stanley Kubricks Vision Mix) to appear. The label picture used in video was taken from DRL, I know this because I snapped it, great to see it again in this context. Surprisingly this hadn't been posted before, The Hacker - 'Fadin Away' [Heinrich Mueller Mix]. Dopplerefekt and Tetris, a winning combination! A video of Dopplereffkt playing 'Hyperelliptic Surfaces' in Amsterdam 2008 you might not have seen. "After a certain high level of technical skill is achieved, science and art tend to coalesce in aesthetics, plasticity, and form. The greatest scientists are always artists as well." 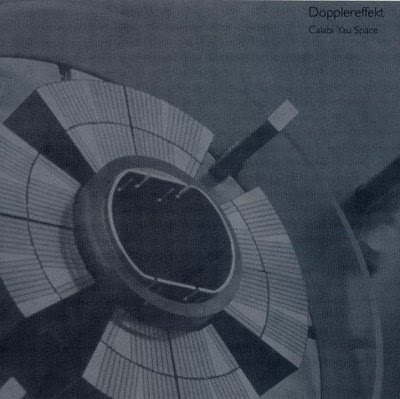 Dopplereffekts 'Calabi Yau Space' album came out in June 2007 on the UK's Rephlex label. This was only the second album proper under this name if you don't include the Gesamtkunswerk compilation, which came all of four years after their previous album under this name, 'Linear Accelerator'. I think you'll agree that with the release of 'LA' this launched an extremely productive and prolific period for the artist who would like to be known as Heinrich Mueller; as beginning in 2003 till now he would release five albums, one a year, not to mention material for his MySpace projects.. This album would have been seen as something of an event at the time and quite a coup, although one they must have been getting used to, for long-time supporters Rephlex to release. Promotion wise it followed the same pattern more or less since 'LA' with no singles with unreleased material being released from it, in this case there was no single at all. Which I like, it's refreshing to get such a complete statement from an artist these days, with no additions being made, it gives the work and period more of a definitive air about it in my opinion. No interviews appeared to promote it either which from my perspective is not so good but this only increases the feeling of finality and completeness of the finished artefact. It is what it is, it has been designed to exist in its own right. Although this album has paradoxically been the one he has promoted in person the most with a long string of ongoing live performances alongside other group member To Nhan Le Thi. Strangely or not no personnel details are given in sleeve notes but I will more or less stick to referring to Gerald Donald as Heinrich Mueller for this article. Due to the nature of the music contained on the album in the press release there was a type of cautionary note attached which read, 'If you are only excited by familiar things or fanatical about contemporary indie/rock then maybe this isn't your bag. If you like the challenge of the new and are intrigued by possibilities and the unknown, we urge you to investigate this album. 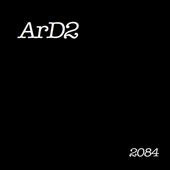 After all, a great melody or rhythm or harmony begins with sound itself and it is on this level that Dopplereffekt is concentrating. 'Techno' in the sense that the term was originally intended.’ Rephlex knew they had something unusual on their hands with this one alright. Thinking more about promotion and press, it can at times be surprising that he is still so invisible in print media outside of reviews, like this time especially as he is on what is generally considered a really hip label and it being all of four years since the previous release as Dopplereffekt maybe you would have expected more notice. At some point in the future I would not be surprised if we saw him with a cover article in The Wire for instance, which seems like such an obvious fit, and this time it wouldn't have been out of the question. I know he may turn down many of the interview requests he gets but I wonder if any high profile magazines have approached him to this usual response? Maybe he is conscious that that kind of exposure could begin to hasten what he does becoming more widely considered as cool with the obvious danger that once labelled and discovered it will inevitably become uncool and dated. But hopefully with a sensitive writer that kind of thing won’t happen as this didn’t stop a highly guarded and secretive group like Basic Channel from doing a cover piece for The Wire in the past which in my opinion didn’t ruin anything about the mystery or overexpose them. But it remains a risk, the outcome of which he has already experienced once before, during the ’94 - ‘99 period of Dopplereffekt, even without doing anything to promote it in the press. 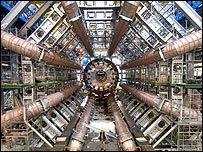 CERN, which as you will see is a major subject of this album, became a major news story itself during September 2008. This was just a few months after the album came out, wonder if it helped sales? There were a lot of scare stories about them creating a black hole which they kept having to assure people was not the case and the world was quite safe. Unfortunately for them they became even more famous for all the wrong reasons due to a fault with the Large Hadron Collider. If you follow one of my links below you can watch a video of them disconcertingly repairing it with a hammer! The latest news from their website is that they will be operational again in Summer 2009. Best of luck to them. On a personal note I reminder writing before about the context of hearing Mueller’s post 2003 music in public and how rare an occasion that is. Well this time I have an equally as exotic story as hearing ‘LA’ being played before what turned out to be the final live appearance by Coil. But exotic only if you don't happen to live in Barcelona as it was there for the Sonar festival when I went into a record shop near the day venue, I’m pretty sure it was called Drone, to especially look for ‘Calabi Yau Space’ as it had not been out long. They had it for me alright when I asked but I was intrigued by the weird sounding music being played just then in the shop so I enquired who it was and you guessed it, they were actually playing the album at the time. As I hope to show, listening to this album in particular it is easy to forecast that as time goes on it will become increasingly regarded as timeless and that the work of the artist Heinrich Mueller, under whatever pseudonym, will continue to be quite unlike anyone else. Why is this, what’s his secret? The obvious part answer that pops into my head is that he is unswervingly following his muse and interests and probably continuing to do what James Stinson talked a lot about, ie. when creating music not listening to other people’s and always striving to do his own original thing. The anonymity and mystery also helps not date it in the present but all of that will be forgotten about in the future when just the music will be left. Mueller obviously feels under no compunction to explain his art, which leaves us only to wonder, if we so choose, at what it can all mean. For this album there were some notes attached to the press release which Rephlex sent out to announce and promote it at the time which regarded string theory that I will refer to later as I presume they were words approved by Mueller himself but outside of this there was silence. As already mentioned, the biggest change, revolutionary for them, was that they began doing live shows as Dopplereffekt the same month as this album came out. Beginning with just To Nhan Le Thi for a few shows until she was joined by Mueller himself which is the arrangement that continues up to today. The shows since then have mostly consisted of material from this album and these usually seated events have not been a bad context to experience the music. On this album we have basically two styles on show, the experimental sounding ones with what I’ve been calling a synergy between the music and subject and also very accessible, beautiful and slow tracks. Not that these latter type couldn't be seen as in synergy either. The almost title track 'Calabi Yau Manifold' gently uncurls and opens proceedings. It is mostly of a delicate construction with just the odd sharp and unexpected turn along the way. It is a thing of real beauty which if you had to describe it as ambient you would have to say ambitious ambient because it is and is successful in this ambition. It just keeps coming in an intricate variety of patterns over its deceptively short 2 minutes and 15 seconds. Like the rest of the album, it is an instrumental. ‘Hyperelliptic Surfaces’ begins with the slow epic grandeur of keyboard synths, again the sound is very rich. There is a lovely and slightly deranged tone which really sticks out of the melody. It track continues to build again and again until it reaches about the three minute mark where it dies away and basically a whole other track starts in initially a very jarring fashion but then even this falls away and another slow but very solid number arises which again bears no resemblance to what has gone before. I love this part of the track even more, the same keyboard tones rise and fall but this time joined by a classic Mueller bass pattern and some other nice synth effects. I guess you could call this ’Hyperelliptic Surfaces part 2’ if you wanted to distinguish it. It is right up there with Mueller’s best work to date in my opinion. But there is just a few more surprises in store for us yet with this curious track. At about the 9 minute mark there is a weird all over the place piece that sounds like bombs going off. It lasts a little under a minute and then another track starts off! This brings us to the tenth minute and I must say it is another really tasteful number which they have hidden away for us here. It snakes along in a slow tempo with a few unexpected touches like a kind of rattle effect throughout. As nice as it is it does have an unfinished feel about it which isn’t helped by the sudden end which comes at a point you feel it could have probably run a bit longer. This final piece lasts about 2 minutes and brings the whole four section piece to 12 minutes 12 sec. You will recognise sections from the live show where I suppose they do expand on them. ‘Holomorphic n-0 Form’ is out of this world, again there are a few sounds we might not normally associate with Mueller. Loads of different and opposing sounds, frequencies and rhythms come in and out of its sound mix. It reminds me of stuff you would have found on Biometry. It is a short track as well, at just over 2 and half minutes. I suppose it could be considered as the least conventional musically but it does have melody in places. It is a bit glitchy as well but this is subtle glitch and nothing that would ever date it to a certain era, I don‘t think. ‘Compactification’ sounds like falling in space to my ears. It is another beautiful slow number. It appears to have some intentional sound dirt which gives it even more of an authentic feel like it was beamed from a malfunctioning satellite. It is again a short track, not even reaching the 2 minute mark this time which again I feel gives it a not fully realised feel or maybe it is exactly as it should be. ‘Mirror Symmetry’ is another track with a feel of Biometry off it. It sounds like a beetle or some other insect scrambling round to no real purpose. That purposelessness makes the track a little redundant but it is what it is or maybe I’m just not a fan of the high frequencies which are peppered throughout. It would be a close cousin to the other Biometry like 'Holomorphic n-0 Form’ as well but this time a more consistent sound palette is being used. It doesn’t go on too long and hits 3 min 30 sec. ‘Non Vanishing Harmonic Spinor’ is instantly just amazing. Again the classic Mueller keyboard pattern pulls us along to be joined by what does sound like a female voice and could be but is a sample here, with lovely atmospherics gently emerging from the background all the time. After what is a fairly lengthy 3 minutes of this the bass line and snare finally kick in and lifts it even higher. It’s like were being teased and it is made to look so easy. This is music with no expiry date, people will still be discovering it in the same excited way for a long time to come I think. ‘Hypersurface’ is constructed purely of slight percussion up to the 2 minute point and then very radically morphs Linear Accelerator style into one sound effect after another within a sort of stop start structure. Again two very different pieces of music and it is still very much music, just tearing itself apart by the end. It is substantial enough time-wise at almost 3 and a half minutes long. The final track, ‘Dimension 11’, is a bit of a surprise in a way, not that they usually meet our expectations! It is yet another template I have never heard used by them before which shoots around in a manic fashion, again maybe insect like as in 'Mirror Symmetry'. To be honest for the album closer and with a title like 'Dimension 11', which I'll soon be expanding on, it is a bit of a disappointment. But I think this is all partly about confounding our expectations to some degree, not a bad lesson to learn in general as well. With this final track for me there is no finality to this collection, which is a good sign maybe, it’s like he ended it in mid thought or something which again could be taken to mean something or not. Of course the above is just my subjective opinion, you will no doubt have your own view of how it sounds and how it was approached. After all that what we really have is not an at a glance 8 track album but more like 11 or 12 tracks even. Even though the album could be judged on the short side at 38 minutes, but as I have no doubt said before, Mueller doesn't really go in for long or overlong albums and it is quality that counts and here I think you'll find lots to love or at least find genuinely engaging. Although, yeah it is a bit short as average albums go but there you have it, this is not an average album. On another point it strikes me that in some ways Donald could be seen as simply doing ambient music. I am here thinking of only certain tracks or parts of tracks from this album. What a horrible image that term brings up in our minds now but there was a time, probably beginning with Brian Eno and I would say stretching into the early days of Warp Records that this was a truly fresh and groundbreaking area to be working in. Since then a lack of imagination or maybe cynicism has become evident. I know these are sweeping generalisations I am making and there are always a few exceptions but I think it’s a true enough statement to make. If he choose to pursue simply this element in his music he might become known as one of the great ambient artists but if he did choose this course he would be immediately put into a box, the same box I oh-so conveniently just put Brian Eno in! This might be one of the no doubt many reasons he continues to include the more unexpected elements on his tracks as well which elevates the whole into something uneasy to classify and quantify. This is music that as a whole can’t be contained or even consumed very easily, it’s no surprise that very few of his tracks from 2003 on have been licensed for compilations and rarely turn up in DJ’s sets. Although to be fair he is not making danceable electro anymore. One of the things out of even the most original artists hands which hasten their work being assimilated by the culture is imitation, but where are the imitators of his work since 2003? I say since then because his work previous to this was of course victim to just this imitation and assimilation into the mainstream. Maybe this is why he changed course? Today, it is true that you’ll find a lot of people using some of the surface elements of his work like anonymity but they might as well still be thinking of his earlier work. But so far musically no-one that I know of is even attempting to rip off or pay homage to it, however you view it. As long as this is the case the longer he might stay on this course. Maybe it’s because he is still so underground, relatively speaking, especially with this album. Now comes the meaning bit, if you care that is. But for me it seems important that it is not only good music but about something as well. The specifics of what I find however can't be discovered by just listening to the album, it does take research and some deep thought but it appears to have been designed for us to take this additional route if we so desire as data-links for CERN are again given. I’m sure we can trust him that he wants us to think this stuff out for ourselves. I know what I'm doing is doing it for you but really I'm just choosing to share what I find and that could be very different to what you find so hopefully it is ok. I'm hoping people will eventually build on what I've done as what I put here is never the final word anyway, although I am trying to be as definitive as I can be but can never really be. It's like a novel or movie you go back to 10 or 20 years later and you see and pick up on things in it you never saw before because you've changed. The first background I will bring to your attention is the text from the press release issued by Rephlex. It said the following about the album subject matter, 'Calabi-Yau spaces are important in string theory, where one model posits the geometry of the universe to consist of a ten-dimensional space of the form. Although the main application of Calabi-Yau spaces is in theoretical physics, they are also interesting from a purely mathematical standpoint. Consequently, they go by slightly different names, depending mostly on context, such as Calabi-Yau manifolds or Calabi-Yau varieties. Although the definition can be generalized to any dimension, they are usually considered to have three complex dimensions. Since their complex structure may vary, it is convenient to think of them as having six real dimensions and a fixed smooth structure.' Incidentally I found that this comes from the CRC Concise Encyclopaedia of Mathematics. Maybe this is Mueller's bedtime reading, probably with a well thumbed glossary from looking up titles! Well that's only the album title dealt with, here's the full background. If you don't feel like reading this part I found two very good documentaries on String Theory that would do just as well, maybe better, address at base of article. 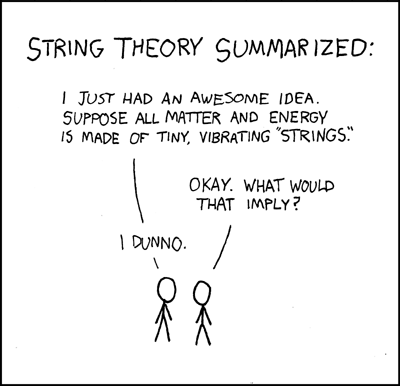 String Theory is either a theory or a philosophy. I say this because it can’t really be proved for now outside of the use of equations. There are also five types of string theory which was not a great situation for something which was also dubbed as the theory of everything. But one type, M-Theory, is where it looks like Mueller is coming from the most. The M could stand for any number of things supposedly, like master, mathematical, mother, mystery, membrane, magic, or matrix. M-Theory brought all of the string theories together by asserting that strings are really 1-dimensional slices of a 2-dimensional membrane vibrating in 11-dimensional space. This main difference which introduces the possibility of an 11th dimension made all the anomalies of the other four models go away. It still makes the claim to be a theory of everything, which is now widely accepted but not proved and manages to combine quantum mechanics (the very small, subatomic particles) with the general theory of relativity (the very large eg. gravity). It turns out that matter is made of strings of energy and not simply particles. The particles are still there and observable but they are made up of strings which so far cannot be seen only theorised about. These strings give off a different frequency which control the four basic elements of the universe, which are gravity, the magnetic force and the strong and weak nuclear forces. Basically the string can vibrate in different modes just as a guitar string can produce different notes, and every mode appears as a different particle: electron, photon, gluon etc. It turns out that the universe is like a symphony in this way with these strings providing harmonies. It strikes me that this is the perfect subject for music and that not all of it would sound harmonic in the classic sense as Mueller ably demonstrates. I've done a list which shows in descending order the levels of matter and where string theory fits in and then in a very general but I think correct way I have also listed the last five Mueller albums and where they correspond to it. I wouldn’t bet my life on the following being correct but it does show that there may be a connection between them all even though the order of release is off, this wasn't important to the Storm Series after-all. But never-the-less the five levels of matter have been interestingly covered by him during this five year period. If I’m right I wonder if having reached the end this signals a move away from this subject or can he go deeper? It would be great if I could manage to fit the four MySpace projects, maybe a fifth on the way?, into this as well, as opposing or shadow themes but so far I can’t but maybe that is asking too much of them and me! 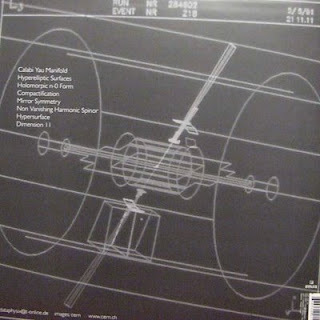 Calabi–Yau spaces themselves received their name in 1985 by Eugenio Calabi and Shing-Tung Yau who first studied them. I've reproduced some for you. 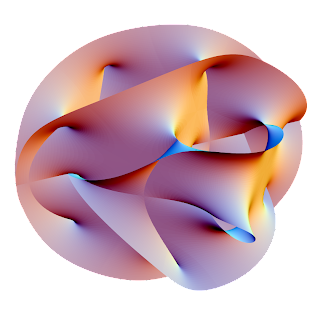 In superstring theory the extra dimensions of spacetime are sometimes conjectured to take the form of a 6-dimensional Calabi–Yau manifold. They are of a holographic form as well, which is a crucial point I will be returning to later. 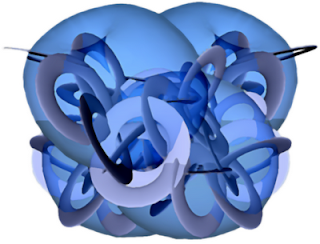 Physical insights about Calabi–Yau manifolds, especially mirror symmetry, led to progress in pure mathematics. Mirror symmetry is a relation that can exist between two Calabi Yau manifolds. 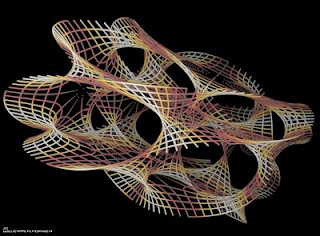 It happens, usually for two such six-dimensional manifolds, that the shapes may look very different geometrically, but nevertheless they are equivalent if they are employed as hidden dimensions of String Theory. 'Mirror Symmetry' also allowed the physicists to calculate many quantities that seemed virtually incalculable before, by invoking the "mirror" description of a given physical situation, which can be often much easier. I should also point out at this stage how all of this ties into CERN, even though it's obvious enough. I’ve gone into CERN before, a massive particle accelerator with four detectors on the Swiss French border and have included a link to their website at base of article as usual. 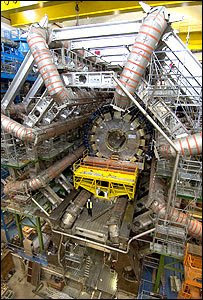 The main thing they are using the Large Hadron Collider at CERN for is to find the Higgs boson. This is because the Higgs boson aka ‘the God particle’ is theorised to be what gives mass to particles. But it is also possible that they may find the extra dimensions which are theorised about in String Theory. As you might know, one of the projected phrases at live Dopplereffekt shows since this time has been 'Extra Dimensions'. This all really ties in with the title ‘Dimension 11’. First of all to explain the other 10 dimensions for you; we have the usual 3 dimensions of space: height, width and breath and the fourth dimension of time; the 6 tiny dimensions found in the Calabi Yau space; which makes 10. Next comes what all of this and us are contained in, which would be dimension 11. This dimension is one huge membrane or brane. I think this is important regarding Drexciya as well in that they called their production company for the Storm Series ‘Dimensional Waves’. In String Theory you also have parallel universes, multiverses. I have reproduced an image that also explains this concept in a more visual way for you. If you can imagine that our membrane universe is floating parallel to other membrane universes, these can crash together, just like waves. This is the language used by string theorists to describe how such a crash begat the big bang, our big bang, the start of our universe. Using M-Theory physicists can now for the first time trace back past the singularity present at the big bang. It’s only about 10 years old but this is truly the theory of everything and we already have it, if it‘s true that is. These parallel universes are other dimensions and they are said to behave like waves so maybe James Stinson and Gerald Donald were aware of this and named their production company with this in mind. Also we might be getting more of a location for where The Other People Place is or what it refers to. If so they would have to have been pretty up to speed with what was current in physics at the time as it was only 1998 by my estimation that this was public knowledge and in 1999 they began using the name Dimensional Waves. Maybe it was an inspired choice? One other interesting thing I found was that along the way as string theory was developed it led to the discovery of the graviton which was a title on Linear Accelerator. These last few points really underlines for me how I cannot encapsulate all of this accurately and definitively by writing about it in this manner. Sometimes its hard to see the forest for the trees or the matter for the particles and I need to take a step back. Although I probably wouldn’t have it any other way it just means that earlier articles could do with some updates or rewriting to make it all clearer what is going on. Just be warned I can only ever give you a piecemeal account of Mueller’s themes and subjects, we will never fully get into his head and thought processes, there will always be more to discover. All the titles to be honest are pretty academic this time and you have to wonder how they really fit in with the music but they do all fit in with String Theory. But I’ll go through the remainder anyway as best as I can understand them. Perhaps the most fitting title musically is 'Non Vanishing Harmonic Spinor' as it ties in with the harmonic series of vibrating strings in string theory which as I already stated derives from the musical concept of overtones, harmonic etc. This title would appear to be a reference to an infinite resonance which is very fitting once you hear the track. A Spinor in this context is an element of a complex vector space introduced to expand the notion of spatial vector. No, I don’t really understand that either! 'Hyperelliptic Surfaces' are quotients of a product of two elliptic curves by a finite group of automorphisms. Hope that is sufficiently informative for you! By the way, they were discovered by Kunihiko Kodaira who was awarded a Fields Medal for his trouble in 1954, being the first Japanese to receive this honour. I also can’t expand too much beyond the basics of the title 'Hypersurface' which seems to fit by way of geometry and appears to be concerned with measuring the dimensions of string theory. 'Compactification' means changing a theory with respect to one of its spacetime dimensions. Instead of having a theory with this dimension being infinite, one changes the theory so that this dimension has a finite length, and may also be periodic. Compactification plays an important part in string theory where one compactifies the extra dimensions of the theory. As for 'Holomorphic n-0 Form', well this is where I get interested again. Because holographics are central to visualizing and understanding string theory especially when we get into 'Dimension 11' territory and the possibilities of parallel dimensions which soon become apparent there. The overarching physical insight behind string theory is the holographic principle. This states that the description of the oscillations of the surface of a black-hole must also describe the space-time around it. Holography demands that a low-dimensional theory describing the fluctuations of a horizon will end up describing everything that can fall through, which can be anything at all. So a theory of a black hole horizon is also a theory of everything. 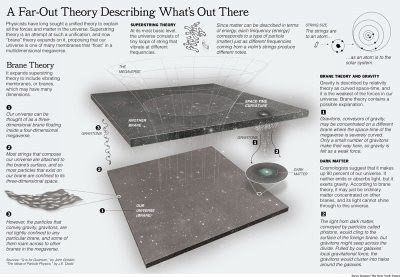 The fact that black-holes, which have been a long time subject of Mueller, happen to fit in very much with string theory has to be significant as well. In the book Power Vs. Force by Dr. David Hawkins I found the quote, "In a holographic world, any "single" event is the result of all events in the universe; "events" as such have no self-existent reality. The universe is man's consciousness - it requires a comprehension beyond intellect." I wonder what Mueller thinks about the nature of consciousness? Going by the MySpace projects like Black Replica and Zwischenwelt he might just concur with this view point of the whole universe being man’s consciousness. The lyric, “Dangling from the universal mind” also appears in one of the latter’s tracks. As a side point, the physicist David Bohm (1919-1992) described not only this holographic universe as well in his work but is probably more famous for his work to prove that the brain also works as a hologram. Holograms might be how everything works? Maybe I should here just mention that of the MySpace projects I just mentioned, Zwischenwelt, which Mueller would have been working on very close to this album ties in very much with all of this with titles like ‘Multiexistence’, ‘Second Reality’ and ’Black Hole’ and a lyric that goes, “On spider webs of time” which I feel is a reference to string theory. Zwischenwelt of course also translates as in-between world. The cover image is fittingly very cold and machine like. 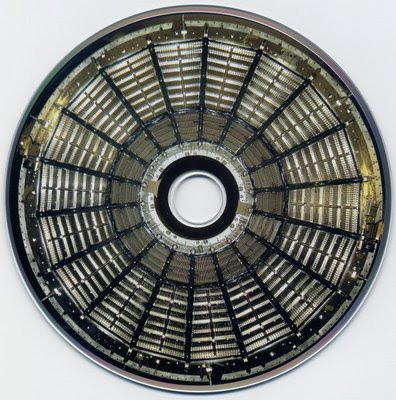 It and the image on the CD itself are parts of one of the particle detectors at CERN of which there are four. I found some other pictures of them for you, Atlas is the one I have reproduced. I think the pictures from the album are from their construction so usually these things would not be visible, but not sure about this. The picture on the CD looks great, with the metallic surface of the disc making it even better and lifelike. It is also used on the record label but to lesser effect on paper. You can even read the event date for when the back cover picture of a result from inside the detector was taken, 2nd May 1991. It would be nice to tie this in with something but would probably be just a coincidence if you could. 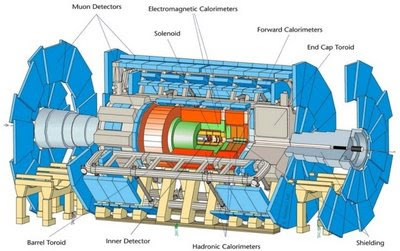 The artwork images are credited to CERN and their website address is given. There were no new studio pictures of the group this time either. Following on from the previous release there is again an email given for contact with the group, dataphysix at t-online.de, which would have been useful for organising more live dates and remixes around this time for instance. I presume this is still operational for anyone wishing to get in personal contact. No I never have, I like to ponder only the artefact and whatever is already in the public domain, for now. To sum up the album I would just repeat myself and say it is a timeless work, but not as challenging as you would expect. Maybe we have simply become more accustomed to the unexpected by now? Regardless, it stands as a remarkable album which compliments its subject matter perfectly. Outside of all the live shows it could be said Mueller's work rate has dropped somewhat since this album with at time of writing only a 4 track 12", Cherenkov Radiation, between then and now. Although he has done tracks for the MySpace projects and remixes in that time. I have no doubt he has been recording more music for future release as well in the past year and half and we could be in for another prolonged release schedule or something else entirely. I will keep up the pace anyway and have the Zerkalo project to do next, then Cherenkov Radiation, and if no more releases have surfaced by then and there is still only one track on the Daughter Produkt player I will be content to backtrack a little and investigate L.A.M. and Clarence G in more detail. There will continue to be more interviews and the latest news updates as well. As ever, if you can make any corrections to this post let me now and I will update asap.